For the Saab "H" engine (a straight-4), see Saab H engine. For the EMD "H-Engine", see EMD 265. The BRM H16 Formula One engine in its final, 64-valve incarnation. An H engine (or H-block) is an engine configuration in which the cylinders are aligned so that if viewed from the front, they appear to be in a vertical or horizontal letter H.
An H engine can be viewed as two flat engines, one atop or beside the other. The "two engines" each have their own crankshaft, which are then geared together at one end for power-take-off. The H configuration allows the building of multi-cylinder engines that are shorter than the alternatives, sometimes delivering advantages on aircraft. For race-car applications there is the disadvantage of a higher centre of gravity, not only because one crankshaft is located atop the other, but also because the engine must be high enough off the ground to allow clearance underneath for a row of exhaust pipes. The power-to-weight ratio is not as good as simpler configurations employing one crankshaft. There is excellent mechanical balance, especially desirable and otherwise difficult to achieve in a four-cylinder engine. Two straight engines can be similarly joined to provide a U engine. D. Napier & Son, UK. Napier Sabre (1938) - H-24, water-cooled horizontal sleeve valves, 36.7 litres 3,500 hp. Rolls-Royce Eagle (1944) - H-24, 46.2 litres, 3,200 hp. A BRM H16 engine, mounted in the back of a BRM P83 Formula One car. The British Racing Motors (BRM) H-16 Formula One engine won the 1966 US Grand Prix with Jim Clark in a Lotus 43. As a racing-car engine it was hampered by a high center of gravity, and it was heavy and complex, with gear-driven twin overhead cams for each of four cylinder heads, two gear-coupled crankshafts, and mechanical fuel injection. The Brough Superior Golden Dream motorcycle, first shown in 1938. A 1,000 cc H-4 design and a few units were produced in early 1939. Any development planned was interrupted by World War II and subsequent years of austerity. Wooler built a motorcycle prototype with a similar configuration to the Brough Superior Golden Dream and exhibited it at the British International Motor Show at Earls Court Exhibition Centre in 1948 and again in 1951. This was replaced by a flat-four engined prototype at the 1953 show. German firm Konig, who specialised in racing outboard motors, built a few 1000cc H-8s c. 1970s, which were basically two of their VC500 flat fours mounted one above the other, with the direction of rotation reversed on one of them. Each half of the engine was a water cooled 2-stroke with rotating disc valve driven by a toothed belt via two 45/90 degree pulleys, plus two siamesed expansion chamber exhausts, fed by two single choke carbs. Both cylinders at each end of each engine fired at the same time, hence the siamesed exhausts for each pair. At least one H-8 found its way into a motorcycle & sidecar racing combo. The VC500 was rated initially at 68 bhp, later 75 & c.100 in the single seater Voigt Renwick Special designed for Hillclimbing, so the H-8 might achieve double these figures, although with very narrow power band and some reliability issues. Subaru produces water-cooled flat-four and flat-six "Horizontally-opposed" engines that are marketed as H4 and H6 which are not to be confused with H-block engines. The naming scheme refers to engine description, similar to inline engines being named I4 or I6, rather than their appearance front-on. Wikimedia Commons has media related to H engines. ^ Willoughby, Vic (1989). Classic motor cycles. Ivy Leaf. ISBN 0-86363-005-7. 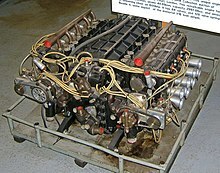 ^ "BRM engines H16". Members.madasafish.com. Retrieved 2010-09-12. ^ Wilson, Hugo (1995). "Brough Superior Dream". The Encyclopedia of the Motorcycle. London: Dorling Kindersley. pp. 34–35. ISBN 0-7513-0206-6. This page was last edited on 13 March 2019, at 09:19 (UTC).